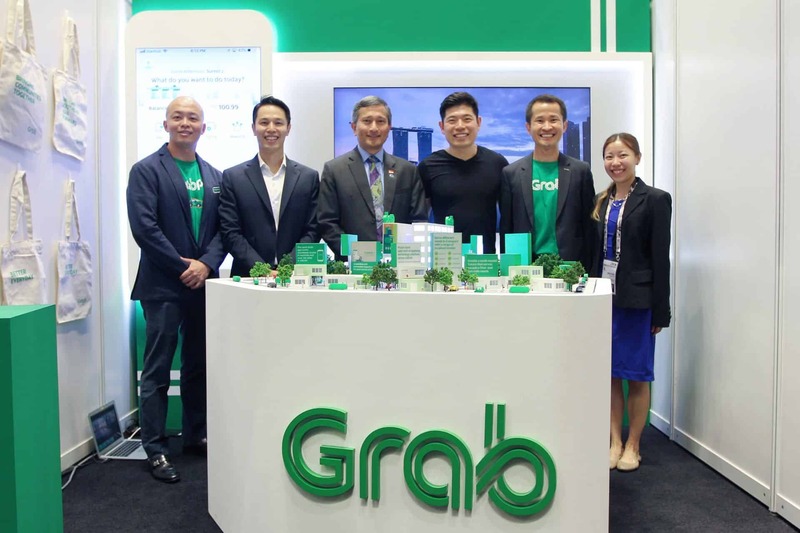 Singapore, 15 November 2018 — Grab, the leading Online-to-Offline (O2O) mobile platform in Southeast Asia, today unveiled its remittance offering under Grab’s financial services arm. The unveiling was witnessed by Dr. Vivian Balakrishnan, Singapore Minister for Foreign Affairs at the Singapore Pavilion at the 33rd ASEAN Summit. This marks a significant milestone towards Grab’s vision for one ASEAN e-wallet that will deepen financial inclusion for the region’s growing middle class consumers and micro-entrepreneurs. “Inter-operable real time regional payment systems will expand opportunities, especially for citizens and small businesses, to access products and services across ASEAN. We hope to see more of such innovative digital services from the private sector,” said Dr Vivian Balakrishnan. Southeast Asia’s remittance market was estimated to be worth US$70 billion in 2017. This market is currently dominated by incumbent Money Transfer Operators (MTO) and financial institutions, but many of the economically-vulnerable foreign workers that comprise one of its most active user groups continue to be reliant on unlicensed agents. The industry still suffers from opaque and expensive pricing structures coupled with inefficient delivery operations, which result in a sub-optimal user experience, and vast sums lost and unaccounted for in this process. As the region’s first wallet-to-wallet remittance product, Grab remittance product will allow both banked and unbanked senders to remit money instantly and securely to receivers in another country using their GrabPay wallets. As opposed to existing options in the market, receivers can access transferred funds instantaneously. In addition, receivers can either choose to cash out the remitted sum via the regular network of cash-out points or use it on everyday transactions, ranging from bill payments to mobile airtime top-ups. Other distinguishing factors are a hassle free and one-time onboarding process done in-app and the guaranteed end-to-end transfer of funds from Sender to Receiver as Grab takes ownership of the funds movement. Besides serving the growing economic migrant community within Southeast Asia, this remittance product will also pave the way for a multi-currency ASEAN-travel wallet that will significantly reduce the payment friction for intra-ASEAN tourism and business travel while enhancing cross-border e-commerce opportunities. “As Southeast Asia’s leading fintech player, Grab Financial is in a unique position to streamline the process of sending money to your loved ones and accelerate financial inclusion for everyone in the region. We saw the painful process that consumers go through each time they want to send money across the borders and thought we could make a difference there. Our wallet-to-wallet remittance product will be the first to guarantee the speed, security and ease-of-use which Southeast Asia’s growing middle class really needs ,” Reuben added. Grab Financial’s remittance product will be launched in early 2019. By leveraging technology, consumers can use their mobile phones to verify their identities within the Grab app on a one-off basis. Subsequent transfers will be hassle-free and can take place at the convenience of the senders. This eliminates the need for in-person identity verification at the physical location of the bank or remittance transfer agent. Currently, most remittance transfer agents do not guarantee an end-to-end transfer of funds from sender to recipient, which introduces some uncertainty to the remittance process. With the GrabPay wallet, remittance flows will be between GrabPay wallet and wallet, giving both sender and recipient full assurance and visibility on the movement of funds. With some MTOs, senders pay substantial all-in transfer fees. In some cases, MTOs may levy additional “convenience” fees for immediate funds collection. With Grab’s remittance product, senders will have complete visibility over the all-in (forex rate and admin charge) fee before the transfer while the recipient is assured of receiving the money in the GrabPay wallet without discretionary additional fees. With most bank to bank transfers, recipients, the unbanked in particular, have to withdraw the funds in cash. With the GrabPay wallet, recipients can immediately access the transferred funds to pay for online and offline everyday services. For those who prefer cash, Grab will also offer a full range of cash-out options for recipients. “The unveiling of the remittance product at the 33rd ASEAN Summit is a meaningful moment for Grab. As a Southeast Asian tech company focused on serving the ASEAN region, we are honoured to be among the few companies invited to present our initiatives and efforts at the “Smart Cities Showcase”, and share with ASEAN leaders how Grab’s tech capabilities can complement their nations’ journey to become smart cities. We look forward to partnering with ASEAN governments on initiatives under the ASEAN Smart Cities Network and work together with them to improve the lives of people across the region,” Reuben said.